VR is in a tricky spot. Devices like the Rift and the Vive have proven that immersive virtual worlds are within our reach, and yet, no one cares. The problem is that current VR headsets still have a lot of rough edges. They aren’t quite precise enough and the good ones are too expensive for most folks. But with the new Oculus Quest, Facebook thinks it has something to solve some of VR’s big issues. Originally codenamed Santa Cruz, the Quest is the high-end, standalone VR headset it’s been teasing since 2016. Unlike PS VR or a Vive Pro, the Quest’s standalone nature means there aren’t any wires to get tangled up in your feet and no need for an external PC or console to provide graphics. The Quest will also work with most previous Oculus software, so at launch there shouldn’t be a shortage of content. 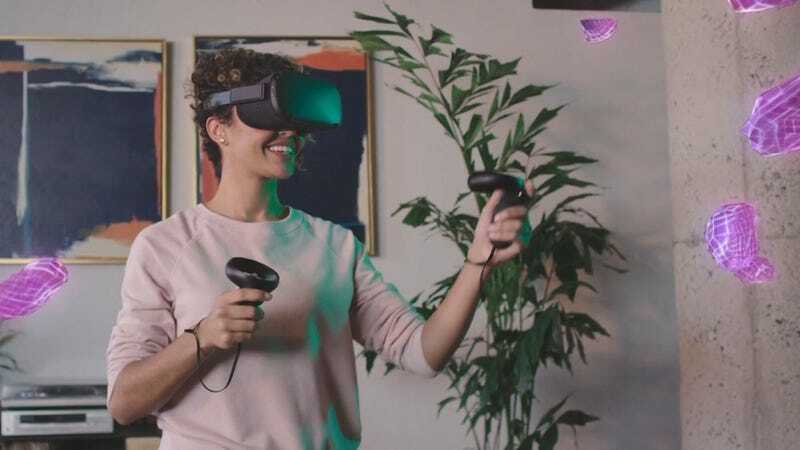 Oculus will include two of the Rift’s Touch controllers with the Quest in order to provide a consistent, yet familiar method of interacting with objects in virtual space. The Quest also sports a full six degrees of freedom, so not only can you tilt your head to look at things, the headset should be able to track your head (and maybe your body?) so you can move around and enjoy the experience of untethered VR. But the most enticing thing about the quest is its price: $400. That’s the same price as Oculus’ current Rift bundle, $100 less than a Vive, and a whopping $400 less than a Vive Pro, and that’s not including the relatively high-end PC you’d need to power them. With a more affordable price and no need for a pricey PC, Oculus is hoping to get 10 million people invested in its ecosystem, at which point, Facebook CEO Mark Zuckerberg says Oculus should become a self sustaining platform that will generate profit for devs while also keeping the company’s VR platform rich with content. Unfortunately, during the Quest’s announcement at Oculus Connect 5, Zuckerberg didn’t mention what kind of internals or optics the Quest is packing. And while company’s official press release mentions a resolution of 1600 x 1400 and 64GB of built-in storage, that’s not a lot to go on. And to make matters worse, it seems the Quest won’t actually go on sale until spring 2019.